Hate to break it to you but…everyone doesn’t age the same way. (Shocking, I know.) Yes indeed, there are a number of reasons why the pace at which anyone ages is different from the rest. One guaranteed way that you’re speeding up your aging process is by the lifestyle choices that you make, more specifically, the bad habits that are injurious to health in so many ways. 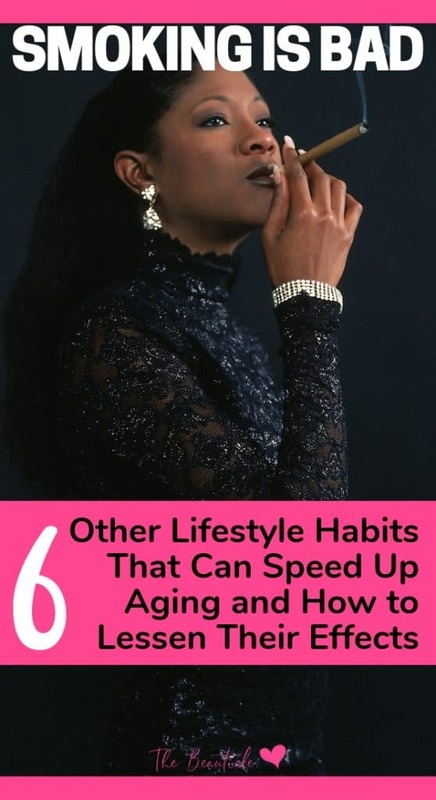 If you have any of these bad habits, you are only fast-forwarding your aging and really should be looking at better habits that will even reverse aging. No schocker here. Smoking of any sort or form adversely affects almost every biological system in your body. It is no secret how it affects the lungs; damaging lung tissue, obstructing air passages and rendering lung tissues incapable of performing their main function: the exchange of oxygen with the inhaled air. It is this very oxygen that the blood carries to all the tissues to keep them healthy and active. This also includes the skin. If the oxygen is compromised, the body will automatically provide the bulk of it to the vital organs (brain, heart and liver), instead of the skin. With this poor supply of oxygen to the skin, the epidermis of the skin is unable to keep healthy or to regenerate. It can no longer form adequate proteins such as collagen, which is the main factor responsible for the elasticity of youthful and healthy skin. As a result, you get wrinkles, dry and damaged skin that make you look years ahead of your age. All the irritants in smoke harm various tissues and organ systems. Some of their unpleasant visible effects on aging is that they cause the white part of the eye, nails, and teeth to yellow, dull and lose their natural color. Giving up smoking can greatly help in reversing aging. If giving up smoking is proving difficult for you, maybe try to address some of the symptoms. Include collagen in your daily beauty routine for a start and whiten your teeth ever so often with these affordable at home kits. Alcohol consumption is perhaps one of the worst offenders if you want to keep your inside out looking and feeling young. Too much alcohol can easily make a person in their 20’s, look like forty – thin, weak, pale, bags under the eyes coupled with the overall neurotic behaviour and mental breakdowns. The effects of alcohol consumption on aging go much deeper than just skin. The organ most affected by this is the liver. The liver is a vital organ, and its failure could potentially lead to death. One of the functions of the liver is to detoxify the body. As alcohol is a toxin, the liver has to work extra hard to remove it from the system. Excessive alcohol consumption will exhaust liver cells so they are unable to function. Not only alcohol increases physiological toxicity, but the failure of liver to fight these other toxins will speed up the process of aging twenty times! It is very common to associate sugar intake with obesity, diabetes and other health issues. But it is less common knowledge that sugar speeds up your aging process as well. Glucose, the simplest form of sugar, is the main substrate for energy in the body but its excess can lead to a number of complications. It can cause wrinkles by dehydrating the skin and can also cause dark circles to appear under the eyes. Glucose metabolism produces AGEs (Advanced Glycation End-products). Appropriately named, AGEs can cause your skin to look old and saggy. A high sugar intake will age more than just the skin. All the organs have to work more to metabolise that extra sugar and will exhaust much faster than the normal, natural pace of aging. For example, a person who is genetically more susceptible to diabetes mellitus might develop it at thirty five years of age. Had he been precautious and careful with sugar intake, he might not have developed this disease at all. While glucose is extremely important for the body, its excess will most certainly age you faster. It is advised to visit a nutritionist to help determine your body’s sugar requirements or begin the transition to a low carb lifestyle to help control the amount of sugar in your daily diet. In this day and age, most of our day involves sitting down for hours. Be it working in an office, studying in an academic setting, or even just sitting and doing nothing at all, there is too much sitting going on in the day. Whether you are being productive or not, sitting for hours can cause aging to creep up on you. More specifically, epidemiological evidence proves that those who sit for more than 10 hours a day age 8 years faster. Imagine, being only 30 and looking 38. Or being 40 and looking 48! Pretty scary stuff, most would agree. This is why you must try to move around as much as possible. Forget the elevator, take the stairs. Never mind the shortcut, walk the longer route home. Make sure to move around every hour even if you have piles of work at your desk. This will help counter aging effectively. Even softer exercise like including some yoga in your day will help to reverse the aging process. Bad news for all those who binge watch – it can make you age faster! There is actually a thing called ‘The Netflix Face’ by experts. This is characterized by wrinkles, spots and fine lines. The screens of mobile phones, laptops and other devices emit harmful radiation that penetrate into the skin and damage it. For those who cannot avoid tons of screen time thanks to their career, a blue lens spectacle will help to lessen the burden on the body. Like previous lifestyles mentioned above, this one also does not stop at the skin alone. Binge watchers should be wary, because this bad habit is causing their brains to age faster too. It can greatly affect different functions of the brain, causing attention deficits, concentration deficits, bad memory, and slower processing and comprehension of information. Binge watching and binge eating are a bad combination which, if not controlled, can be very dangerous for health. Avoiding it will help you age slower. While this does not exactly show signs of aging on the face, it does so in the body. The posture affects how well blood is being pumped in the body and also how well a person breathes. For someone who is used to “slumping” all the time, straightening up will immediately reveal what a difference good posture makes. An upright and erect posture is very important in controlling aging. Bad postures lead to problems that are mostly seen in adults and are now experienced by youngsters. For example, back aches, pain in joints and breathlessness. It is important to maintain good posture at all times to avoid the development of such signs of aging. Pay attention ladies. As much as you may love the difference that makeup can make to your appearance and confidence, it is also one of the biggest culprits in premature aging. The internet is loaded with tutorials that show a person putting on layers upon layers of makeup, so much so that it is hard to keep up! With that amount of makeup, comes the removal and cleansing process too. No matter what an excellent brand you take help from in this regard, it is still mostly chemicals that will rob your skin of its natural moisture and components, dehydrate it and cause wrinkles. Applying makeup unnecessarily makes you age many times faster. To avoid this, it is important to use makeup as minimally as possible. Check out these 16 beauty must haves for your at home facial kit that will help you to replenish your skin. After all the reasons why reverse aging is beneficial for the maintenance of healthy systems in the body, comes what looking younger can do for you. Nobody likes to look or seem old. ‘You look much older than your age’ is definitely not our favourite compliment. People invest so much time, energy and money to avoid things like these. The appearance of the first wrinkle or grey hair can be quite depressing. Reverse aging can take away all such worries and give your confidence and self-esteem a boost. You look what you feel. If you feel younger from the inside, you will look younger too. It is not just the skin that needs to look vibrant and young to make you feel better about yourself. Reverse aging, by any means takes away many such insecurities and worries. Diet, activity level and stress management will play the greatest role in reversing the aging process and maintaining a high quality of life. The benefits are clear. Lessen the bad habits in your life and maintain good habits to look and feel your best.